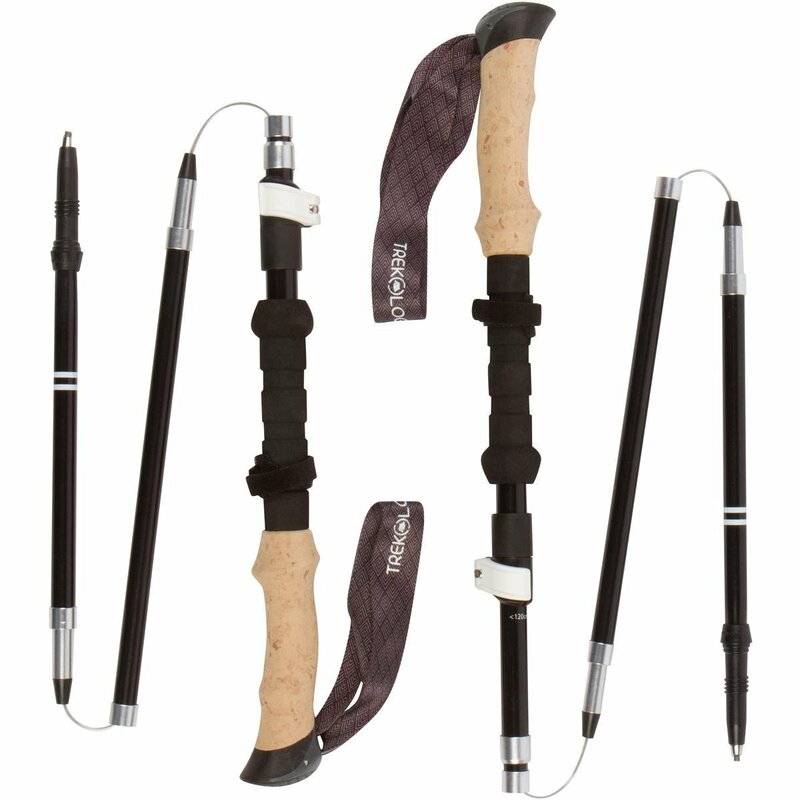 Whether you’re a seasoned mountaineer or an occasional hiker walking poles can enhance your experience by giving you stability, allowing you to hike on a variety of terrain and by protecting your joints. They can range in price from about €10 to over €200 but just what makes one pole different from another? 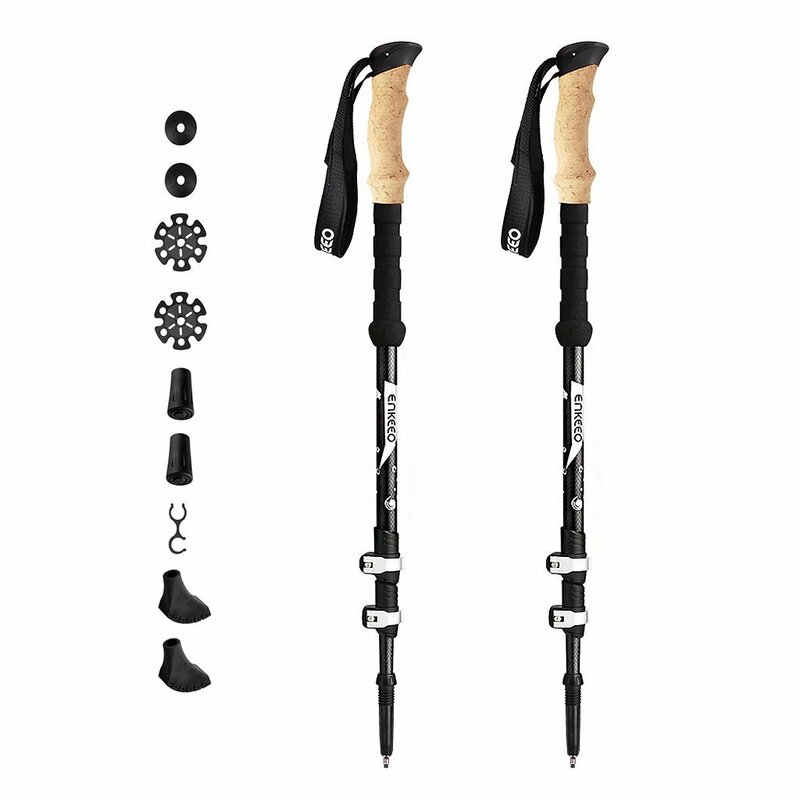 Use our comprehensive guide to find the best walking poles for you. When buying a pair of hiking poles, you should look out for a number of things. Your poles need to be the right height for you or else they could become more of a hindrance than a help. Find out if the poles are height adjustable or a fixed height. If buying fixed height poles make sure they are the right height. Your elbows should be at a 90-degree angle when holding them. If you are tall, be careful that the maximum height of adjustable poles is tall enough for you. Most extend to 135 cm which should be fine for those over 6ft. There are different methods to adjust the height on different poles. Some poles twist in to secure the height and others use clips, which allow you to change the height faster. If the clips are good this is the most convenient way to adjust the height. A few other things to consider when making your decision are as follows. Poles can either break up into parts for storage and transport or are telescopic. Telescopic poles are usually longer when collapsed and often won’t fit into a standard backpack. Carbon fibre poles are lighter than aluminium but aluminium tend to be sturdier. Depending on how you intend to use your poles you might prioritise one over the other. Grips can be made of foam or cork. All of the poles we reviewed are either made of cork or EVA foam, both of which absorb moisture. Some have a second grip below the regular grip, making it easier to change incline without adjusting the height of your pole. Now that you know exactly what to look for, here are six different hiking poles of varying prices, quality and features. You’ll find one here that best suits your needs and budget. These poles are 100% carbon fibre, meaning they are quite light at 475g for the pair. Despite their light weight, these poles are sturdy and resistant to bending or snapping. The cork handles mean that your hands are less likely to slip. These poles are telescopic and the height is adjustable (between 63-130 cm). The height is secured using clips. They collapse to 63 cm which isn’t the smallest collapsed length we’ve reviewed but for poles that adjust telescopically, this is normal. They come with interchangeable carbide tech tips, low-profile trekking baskets and powder baskets allowing you to use these in all conditions. These poles are a great investment for regular hikers. You won’t need to replace these for a long time. These poles in three sizes and are not height adjustable. They come in 110cm, 120cm and 130cm. They are 100% carbon fibre and extremely light. A pair weighs 284g for the 110cm pair, 298g for the 120cm pair and 315g for the 130cm pair. They fold up to a very compact size of 36cm, 40cm and 43cm. The locking mechanism around the joints is reinforced making them very secure. The grips are EVA foam grips which actively absorb moisture. The poles separate into three sections for folding and there is a hidden cord to keep them together. They come with interchangeable, non-scarring rubber tech tips and carbide tech tips allowing you to use these on different terrains. 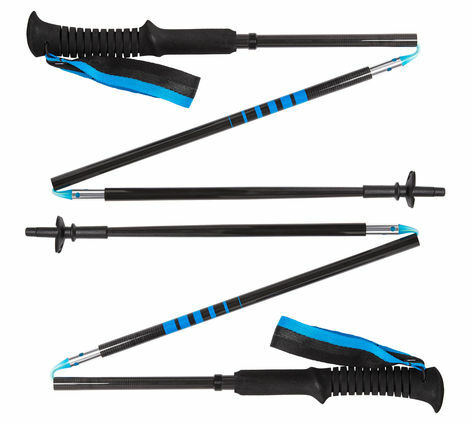 These poles are convenient and would be perfect for travel given their size and light weight. These poles are 7075 aviation aluminium meaning that they are extremely sturdy. However, they are the second heaviest poles we reviewed at 530g. They break into three sections for folding and are 52cm when collapsed. When assembled they can be adjusted from 65-135 cm meaning they would suit people of almost every height. Clips hold the poles in the desired height. There are both cork and EVA foam handles on these poles which both absorb moisture to avoid slipping. Having two grips makes it easy to change incline without having to adjust the pole height. The poles come with snow baskets, mud baskets, rubber feet and rubber tips giving you the freedom to use them on different terrains and in different weather. 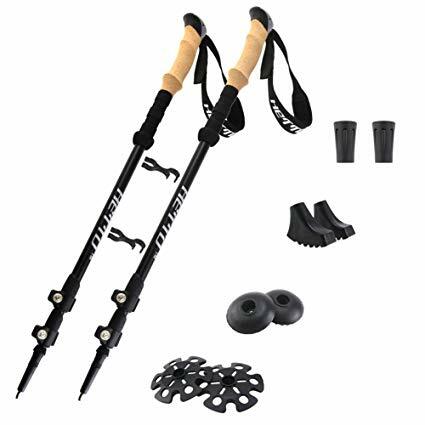 These poles are perfect for beginner or intermediate hikers who want sturdiness and quality but do not hike enough to justify an investment in a more expensive pair. These carbon fibre poles are light but when collapsed are not very compact. Despite this, they are a great purchase. The height is adjustable between 66-135cm meaning again that they are suitable for people of all heights. They are telescopic and the desired height is secured by quick lock clips. The grips are EVA foam which absorbs moisture. These poles are hardwearing and sturdy but still light at 425g. They come with boots, mud baskets, snow baskets and small tips allowing you to use them in a variety of areas. The one issue with these is that the carbide tip is slightly short so there is potential for slipping but if the height is adjusted correctly this shouldn’t be an issue. These strong and sturdy but reasonably priced poles are good for regular hikers who don’t want to fork out for a more expensive pair. Made of 7075 aviation aluminium these poles will withstand a lot. 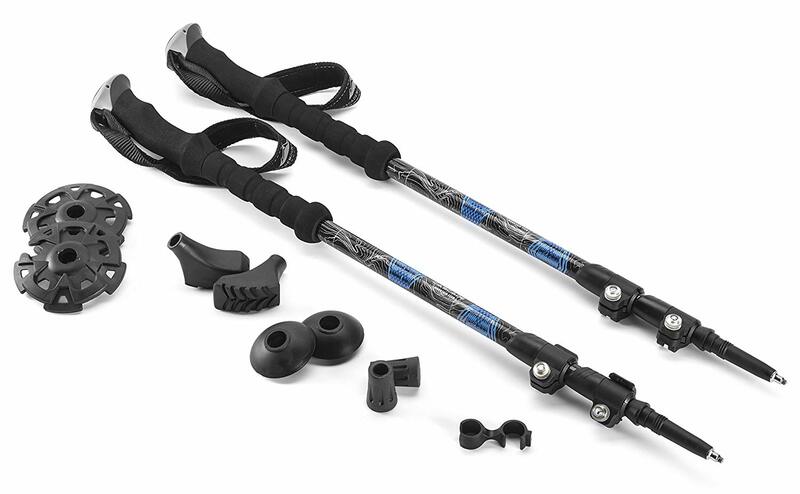 Despite being the heaviest hiking poles in this review at 540 g they are still manageable and the extra weight obviously plays a part in how hardwearing they are. The compact size of 38cm when disassembled means they will slot into most backpacks when not in use. They break into three parts for folding and are connected by a hidden cord. They come in two size options 100-125cm or 115-135cm. Flat top clips hold the poles in the correct height and prevent the joint from slipping. The assembly is quick and simple. The joints are reinforced with metal caps for extra security. There are two grips: one of cork and one of EVA foam. This is a very handy feature as two grips mean you don’t have to adjust the height when changing incline. They come with a mud stop, a rubber tip and a carbide tip as well as a handy carry bag. 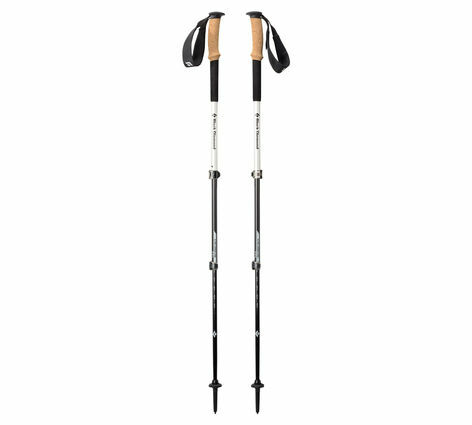 For beginners and more advanced hikers alike these poles are a quality purchase for a bargain price. These are definitely made to compete with the more expensive brands and are succeeding. These telescopic, fibreglass poles are light (450 g) and convenient with quick lock metal clips which can even be used while wearing gloves and are very secure. The EVA foam grips are made to look like cork. They absorb moisture and allow a secure grip thanks to the ergonomic design. There are a second set of grips enabling you to change incline without adjusting the height. The height can adjust between 66-135cm. When collapsed they are 65cm. This is slightly too large for an average backpack but given their light weight will easily clip on to the front or side. They are strong for how lightweight they are but compared to some of the aluminium poles we reviewed would be best for trails and light hikes rather than serious climbing. They come with snow baskets, mud baskets and rubber tips. These are a perfect pole for occasional hikers or beginners.